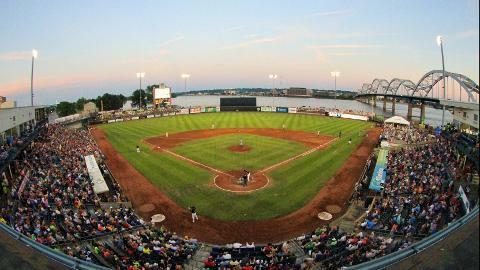 After four weeks of nationwide voting by fans and readers of 10Best.com and USA TODAY, Modern Woodmen Park, the home of the Quad Cities River Bandits, is the "Best Minor League Ballpark" in the 2013 10Best Readers' Choice Travel Awards. USA TODAY and 10Best.com announced the Top 10 ballparks Wednesday. Modern Woodmen Park received the most votes from readers, fans and the general public nationwide among 20 nominated ballparks. The nominees were chosen by a panel of experts from USA TODAY, 10Best.com, and other contributors and sources for other Gannett properties. Throughout the competition, Quad Cities residents, visitors, fans, media and public leaders supported the campaign for a venue that has been frequently recognized nationwide as a unique destination for Minor League Baseball and family entertainment. "This is a great honor that belongs to the City of Davenport, the mayors and city leaders from all of the Quad Cities, and people all throughout this great region," said River Bandits owner Dave Heller. "Their constant and enthusiastic support of this club and this great ballpark continues to overwhelm and gratify us. But we will never rest on any laurels - we will continue to work to constantly improve and make even better this baseball diamond that has become the crown jewel of the Midwest and the nation." "This designation affirms what we in the Quad Cities have known all along, that Modern Woodman Park, 'A jewel along the Mississippi,' is the most beautiful minor league park in the world," said Davenport Mayor Bill Gluba. "This national recognition serves as one more sign that our Rivervision plan, to make Davenport's Riverfront the most spectacular and magnificent between New Orleans and Minneapolis/St. Paul, is coming to fruition." The River Bandits will host a special recognition for the Quad Cities community prior to the team's next home game at 7 p.m. Saturday, Aug. 17. At every River Bandits game through the end of the 2013 season, fans can sign a banner naming Modern Woodmen Park the "Best Minor League Ballpark". The banner will be permanently hung inside Modern Woodmen Park. In addition, the River Bandits will celebrate the ballpark's No. 1 ranking by offering $1 general admission tickets to the 7 p.m. game Monday, Aug. 19, with upgrades available for $1 more. Modern Woodmen Park, which opened in 1931 as Davenport Municipal Stadium and was previously known as John O'Donnell Stadium, is the oldest stadium used continuously by a current Minor League Baseball team for more than 50 years. The current Midwest League franchise has played in it continuously since 1960, and more than seven million fans have passed through its gates in that time. As the River Bandits ownership, Main Street Baseball has brought the stadium several improvements - including the Sky Deck, Pepsi Loge Boxes, the DHCU On-Deck, the Crop Production Services Corn Field, a new high-definition video board and LED ribbon board. Earlier this season, Main Street Amusements opened a FlyWireTM dual zip line by Extreme Engineering, and a Mediacom Frog Hopper by S&S Worldwide, as part of a growing amusement lineup, including a new 112-foot tall Ferris wheel and carousel, that will continue arriving through next season. UP NEXT: The first 2,000 fans to Modern Woodmen Park Saturday night will receive a bobblehead of Minnesota Twins first baseman and former River Bandit Justin Morneau, courtesy of Mediacom and the Dispatch-Argus. The 7 p.m. game kicks off a seven-game home stand through Friday, Aug. 23. Single-game tickets are on sale at the River Bandits box office at Modern Woodmen Park, by phone at 563-324-3000 and online at www.riverbandits.com. Season ticket and mini-plan packages start at just seven games and begin at less than $50. Call a River Bandits account representative today to choose your seats and get the details of our various mini-plan packages. ABOUT THE BANDITS: The River Bandits ownership is making one of the biggest improvements to Modern Woodmen Park since the ballpark was first built back in 1931! A new Ferris wheel, standing 112 feet over the playing field, is planned for next spring, along with a carousel and other new games and attractions. This season, the team just unveiled a new 300-foot long dual zip line, a rock climbing wall, a Mediacom Frog Hopper, and a number of new bounce houses. The team also boasts a new major league affiliate, the Houston Astros, and fans can see the first team in Minor League Baseball history with back-to-back No. 1 overall draft picks - 2012 top pick Carlos Correa and 2013 top pick Mark Appel, as well as 2012 first-round draft choice Lance McCullers. With new rides, new attractions, new improvements, a new affiliate and future major league stars, the second half of this season is one every fan will not want to miss!